Join us for Totus Tuus 2019! 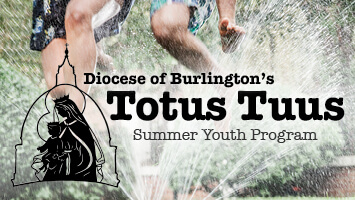 The Totus Tuus Summer Catholic youth program will be hosted at Immaculate Conception Parish in St. Albans during the week of June 17-June 21. Totus Tuus is dedicated to sharing the Gospel and promoting the Catholic Faith through evangelization, catechesis, Christian witness, and Eucharistic worship. Our program assists parents and parishes in the evangelizing and catechizing of their youth by supplementing the work they are currently doing. Please see the forms below for parish contact information, registration cost, program details, and more. Check out the Totus Tuus 2019 Schedule to see the rest of the summer’s parishes and dates!